Many organizations increasingly rely on tablets, smartphones, and other mobile devices that enable their employees to do their jobs anywhere at any time. However, with this increased freedom comes increased risk. Devices may be lost or stolen, but the more important concern is the corporate data that resides on or is accessed from mobile devices. This may be proprietary information about the company’s products or offerings, or it may be sensitive client data. 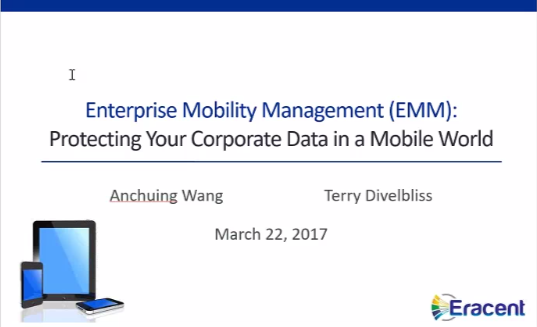 Securing access to this data on mobile devices is critical, and Enterprise Mobility Management (EMM) solutions offer that level of control and peace of mind.